June was an exciting month for the Foundation and the Project.We kicked off FreeBSD’s 25th Anniversary celebration on FreeBSD Day. Well, we actually kicked it off, with cake, at the BSDCan FreeBSD Developer Summit on June 5. The cake was good, but celebrating in conjunction with FreeBSD Day was exciting. The Foundation has been supporting FreeBSD for 18 of those 25 years, with many of our team members contributing to FreeBSD even longer! This month we focused on providing resources and material for promoting and teaching about FreeBSD around the world; we brought on some new team members to help support critical areas in the FreeBSD Project; managed the successful 11.2 release, and committed to promoting FreeBSD at conferences this summer and fall. Please take a moment to read about this work and more in our June newsletter! Oh, and Happy Summer! FreeBSD’s continuous integration system is up and has been running for a long time. The latest generation of the system was designed and deployed in 2016. The introduction of history and the current system can be found in Li-Wen Hsu’s talk in BSDCan 2017. As of the first week of June the CI system is build-testing all supported development branches and architectures every time a new change is found in the source repository. In addition x86 architectures run the regression tests in a virtual machine (using FreeBSD’s bhyve hypervisor), and a few other architectures, like riscv64, boot and execute the test suite in QEMU. In the Ottawa and Paris developer summits in 2017, people discussed extending the current CI system with the ability to test on real hardware. Besides large x86 boxes, there was a lot of interest in embedded systems development board with various architectures. Zakary Nafziger, a University of Waterloo co-op student who worked for the Foundation during the Fall 2017 term, designed a Micro SD card multiplexer. It allows a Micro SD card to be electrically switched between a disk image writer and the SD card slot on the embedded board. The Foundation is now sponsoring testing related work for the FreeBSD Project, and one of the important working items is the setup of a hardware testbed. This will initially be deployed in the Foundation’s Kitchener office. By the end of June, the proof of concept of the embedded system CI was created and connected to the staging environment of FreeBSD’s CI server. We are working with the FreeBSD Cluster Administration team to connect it to the production CI server. 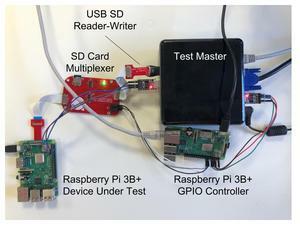 Test master connect to controller via a private network and uses a GPIO pin to control the SD card multiplexer. Allows remote control of its outlets. We use this to switch the device under test on and off under the control of the test master. We use Raspberry Pi 3 B+ as the pilot platform to test. The related code for building images for test and control of the related devices will be merged to the FreeBSD’s CI project repository on github in July. The future work of this hardware CI testbed includes extending it to test more embedded boards. We also plan to publish the built images of different supported embedded boards to the artifact server to allow the public to do more testing. We also plan to have images that contain regression test suite and run on the target embedded boards. For the next part of hardware CI work, we plan to setup a PXE boot environment for testing the x86 architecture on real hardware, to support testing security update patches, network performance, benchmarking, and other special device tests. We would like to acknowledge all of those in the FreeBSD community who have helped CI system and build infrastructure to make our first step to hardware CI successful. I’m extremely excited to share the news that we just received an anonymous donation for $100,000! Donations like this validate my belief that our work is recognized as imperative to individuals and organizations that use FreeBSD in research, education, job training, computing, and products! As a 501(c)3, we are legally required to operate in the public good, meaning our work is directly related to providing a high-quality, innovative, and secure free operating system for anyone to use around the world. From our humble beginnings, founded by Justin Gibbs with only two board members in 2000, to a staff of 7 employees, 8 board members, and a handful of part-time contractors today, we’ve grown to support many critical areas of FreeBSD. Improving quality assurance, continuous integration, and automated testing, by hiring a full-time person to work on these efforts. Making improvements to the FreeBSD tool chain, implement security fixes, and integrate performance, profiling and tracing tools by adding another part-time software engineer. As you can see above, we are always striving to further the advancement and use of FreeBSD, but we can’t do this without your help. Sadly, this year we’ve only raised $297,000 to support all this work! If your company is using FreeBSD, you are benefiting from the work we are doing. Please consider joining our growing list of 2018 partners such as: NetApp, Microsoft, Tarsnap, VMware, NeoSmart Technologies and XipLink (who just committed to a Silver partnership!). We are indebted to these companies who have already shown their commitment to open source. Thank you for supporting FreeBSD and the Foundation! You can also help us reach out to companies benefiting from using FreeBSD, by making connections for us. We want to talk to these companies, to not only ask for funding, but also to help facilitate collaboration between them and FreeBSD developers. If you can assist us in setting up a meeting, please contact me. Finally, as a FreeBSD community member, please consider making a donation today, and help us continue our work for FreeBSD! The FreeBSD Release Engineering team announced the availability of FreeBSD 11.2-RELEASE, the third release from the stable/11 branch, building on the reliability and stability of 11.1-RELEASE. The release announcement is available here, and a PGP-signed version of the announcement is available here. Additional web pages specific to 11.2-RELEASE, such as release notes, errata information, and installation instructions can be found here. Thank you to everyone who helped celebrate FreeBSD Day and the FreeBSD Project’s 25th Anniversary on June 19. 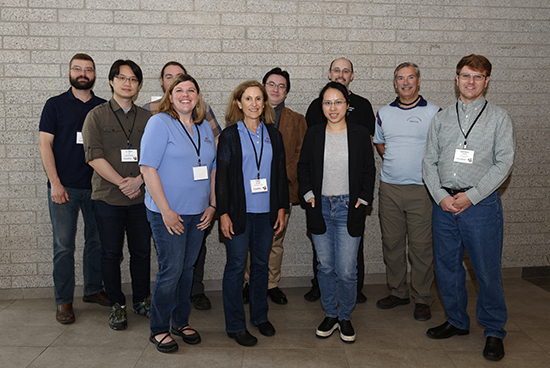 We enjoyed reading and sharing your FreeBSD origin stories and were thrilled that you were able to join us in honoring the FreeBSD Project’s pioneering legacy and continuing impact on technology. 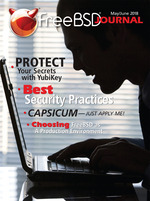 You can find out more about FreeBSD Day here. If you haven’t seen it yet, please take a look at retrospective created by Allan Jude at BSDNow with over 6 hours of interviews from members of the FreeBSD community including a new interview with Dr. Marshall Kirk McKusick from BSDcan 2018. The Foundation will continue to celebrate FreeBSD through the rest of 2018. Next up, join us at OSCON! On July 18th, We’ll be participating in Open Source Initiative’s Open Source Anniversary Track and Anniversary party. Find out more here. 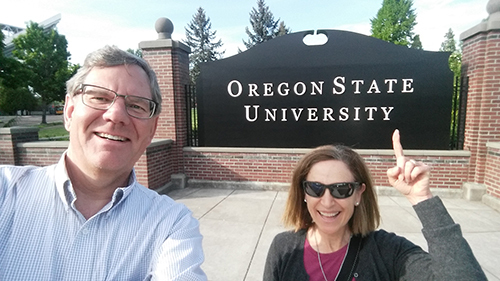 While in Oregon, we also took advantage of the opportunity to meet with Lance Albertson Director of Oregon State University’s Open Source Lab (OSU-OSL). As reported previously, OSL has recently agreed to host some server’s on behalf of the Foundation for FreeBSD development and testing. So far we have deployed two Power8 servers on loan from IBM; and a HPE Proliant DL360 Gen10 server that has been purchased for enablement of the latest XEON Scalable server platform; and the continued development of persistent memory support (e.g. NVDIMM-N and future 3D XPoint(tm)) in FreeBSD. Developers interested in utilizing these systems for bring-up, test, and development should contact me. The Travel Grant Application for EuroBSDcon 2018 is now open. The Foundation can help you attend EuroBSDcon through our travel grant program. Grants are available to FreeBSD developers and advocates who need assistance with travel expenses for attending conferences related to FreeBSD development. EuroBSDcon 2018 applications are due August 2, 2018. ​XipLink specializes in optimizing wireless links, WANs, or any network that experiences high latency, asymmetric allocation or high bit error rates. XipLink’s solutions are seen mainly in satellite networks, aviation, military, government and maritime systems. FreeBSD has been providing just that to XipLink since release 4.5. It made our first implementation of the Space Communication Protocol Standard a lot easier with its friendly BSD licensing model for kernel code, as well as, with the tremendous amount of documentation available on its network stack (especially the TCP/IP Illustrated Series by Wright and Stevens). Since then, things have steadily improved. System reliability, performance, extensive code reviews and attention to detail permeate the entire source tree, making FreeBSD the perfect environment for our continuously evolving and increasing feature set. XipLink is proud to support FreeBSD, by sponsoring FreeBSD developers, submitting patches and features, or simply through subscriptions to the FreeBSD Journal and donations to the Foundation.